A virtual private server allows you to configure your hosting environment to suit your business requirements whilst still sharing space on one of our servers. Get secure and reliable hosting solutions for your websites without investing in expensive hardware. Secure, reliable, lightning fast virtual private servers to give your business the power it needs. You have full control to tweak your virtual hosting server to a set up that suits your business’ requirements. 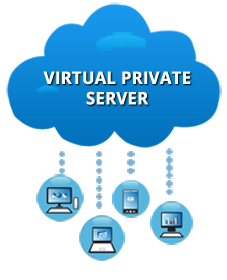 Dedicated virtual hosting server resources ensure your server will run reliably and predictably. Our high grade enterprise security software will protect your data. Our SPAM filters and antivirus software are top-of-the-line. Pay for the services you need when you need them without having to worry about outlaying large sums of money for infrastructure. Our focus is your business. Complete Cloud provides you with solutions to meet your individual business’s needs, not just another shiny box. You have full control to configure your virtual hosting server to a set up that suits you. You can install the software that you need in the manner that you need it. We can easily back up your entire virtual hosting server to another server. You can scale your server up or down on demand to ensure your IT infrastructure grows with your business without interruption to day to day activities. Our dedicated team work to understand your business and what makes it tick to help you get the best performance out of your virtual server. Access reporting on your server performance, trends and peak load times. The best way to increase success is to track it. We keep a close eye on our infrastructure to ensure your site runs smoothly. If a problem is detected, our support engineers will start working on it, usually before you’re even aware of it. 24×7 phone, email and chat support when you need us. If there is a problem with your site, you want the best team in the business on it straight away. We have refined our failover and backup procedures over many years. When your site needs to get up and running quickly, our team can make it happen. In the event something does go wrong, our virtual hosting servers can be quickly restored and upgraded with minimal impact to your service. Not sure which hosting is right for your business? View our services below or contact us on 1300 736 600 to create the right package. Quality reliable virtual hosting with a good value price tag. Resources are shared with a common IP address making hosting more affordable. Shared web hosting details. Your own virtual server on shared hardware means you can configure your server and install software that you require with a dedicated IP address without the usual associated costs.